By default, all of the application’s files will be installed in the home directory of the user. Therefore, there is no need for the user account to have administrative rights to install Reveal Chromatography. For more details Reveal’s usage of resources and how to evaluate needs, refer to the user manual’s dedicated section: Large-scale computations with Reveal. The latest version released of Reveal Chromatography is version 1.0.0. It was released on March 18th 2018 and a 1-click installer for Windows can be downloaded from here. Contact us if you need a Linux and OSX installers (license holders only). This version is fully backward-compatible in addition to containing lots of new features, improvements and bug fixes (see the changelog). All users should upgrade. Note that the release has also been published as an in-app update, available to all existing users with version 0.8.0 and above. For more details about the Application Updater , see Updating the Reveal application. If users already have an older version of Reveal Chromatography installed, we recommend that users uninstall it first. For instructions on how to uninstall Reveal, see the Uninstalling Reveal Chromatography section below. OSX and Linux platform installers come in the form of a single .tar.gz file. Once downloaded, unpack the file into the reveal_chromatography folder. Then, refer to the INSTALL.txt file for instructions, and README.txt for more details. No dependencies are required for installation. To preserve performances, Linux and OSX installers don’t come with a pre-compiled version of CADET, but only the source code of our custom pH-enabled version (official CADET 2.3.2 also supported). The CADET install instructions should then be followed and we provide support for all license holders. Once a version of CADET is installed, launch Reveal Chromatography, and edit the preferences ( Edit > Preferences ) to point to the desired cadet-cs executable (solver tab). The default installation creates shortcuts to the application launchers (there are two) in the top section of the start menu, as well as a Reveal-Chromatography folder in the program list of the start menu. This is also where users can find the application’s un-installer. Reveal Chromatography app launchers in the Windows 7 start menu. 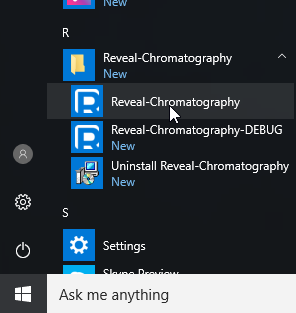 Reveal Chromatography app launchers in the Windows 10 start menu. Both launchers run the same version of the application. The only difference is that the debug version displays some details of the applications’s execution progress in a command prompt console. Once the software has been successfully installed, we recommend that users walk through the Getting Started guide to learn about using the core features of Reveal Chromatography. One should avoid adding the whole reveal_chromatography/bin folder to the PATH environment variable, as that might lead to modifying the environment Reveal needs to run (it is a self-contained Python environment). Click the start menu, navigate to the All Programs section. 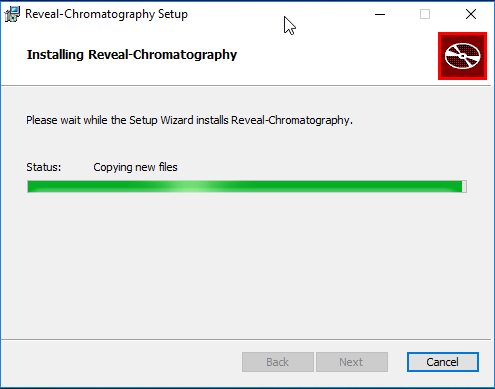 In the Reveal-Chromatography folder, select Uninstall Reveal-Chromatography and follow the instructions of the uninstaller. Then, navigate to Local to make sure no Apps\Reveal-Chromatography folder remains. During the normal course of utilization, the application stores information (CADET input files, logs, user data content) in the application data folder located inside the hidden folder of your home folder C:\Users\<USERNAME>\AppData\Roaming. 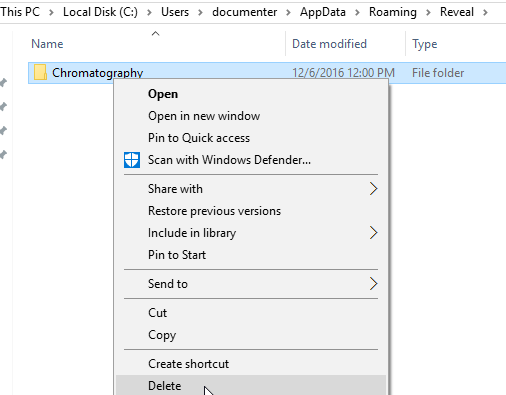 To delete all Reveal Chromatography related files, open the Windows file explorer, navigate to your home directory, and in the path bar, add AppData to enter the hidden folder. Then, navigate to AppData > Roaming > Reveal and delete the entire Chromatography folder. On OSX and Linux environments, removing Reveal Chromatography means deleting the unpacked folder reveal_chromatography. For a complete and more permanent removal, users will also need to remove any alias added to the bashrc/bash_profile and the ~/.reveal/chromatography folder should also be deleted. That will remove the preference file, and all stored user data (products, components, columns, ...).